Megadeth bassist David Ellefson remains hopeful the veteran thrash band will eventually win a Grammy Award after recently receiving their 12th nomination in the Best Metal Performance category as part of the 2017 ceremony. The title track to the group’s fifteenth album, “Dystopia”, will compete for the honor alongside tracks by Baroness ("Shock Me"), Gojira ("Silvera"), Korn ("Rotting in Vain") and Periphery ("The Price Is Wrong"). “It's recognition by your industry and by your peers for the work that you've done,” Ellefson tells FeMetal TV. “And I assume it's nice to win [laughs] - hopefully we'll know one day. It's always nice to be nominated. Megadeth received their first Grammy nomination for the title track to “Rust In Peace” in 1991, and the “Dystopia” nod marks the band’s fifth in the past seven years. 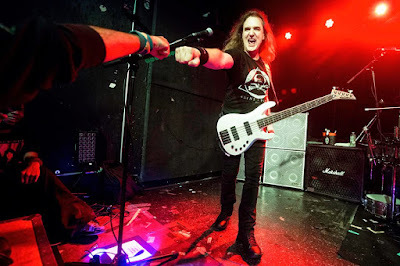 Given the scope of music recognized by The Recording Academy, Ellefson has come to appreciate that metal is included – even if it barely registers a mention on the annual broadcast, let alone have a heavy rock act actually perform on the Awards. "The Grammy thing is obviously wonderful,” the bassist explains, “But I think we are a genre… And there's a lot of genres there, because there's something like a hundred categories; they only televise, like, twelve or fourteen of 'em on TV, but there's another, literally, sixty [or] seventy categories that they give away from 1 p.m. 'till 5 p.m. before the televised section starts – Tejano music, things that I barely even have heard of. And they're honoring that. “And that is the thing that I think is cool about the Grammys – they have really widened themselves out to honoring all of these different genres, and deservedly so. There isn't just one-size-fits-all in music, so it's cool that they honor that, and it's great that metal is one of those." “Dystopia” debuted at No.3 on the US Billboard 200 with opening week sales of 49,000 equivalent album units earlier this year.